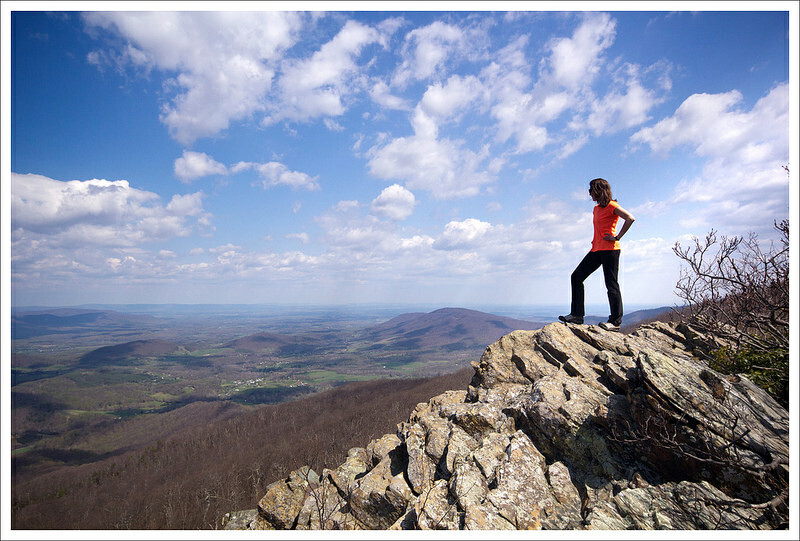 This easy 4.5 mile out-and-back along the Appalachian Trail offers great views in many places! 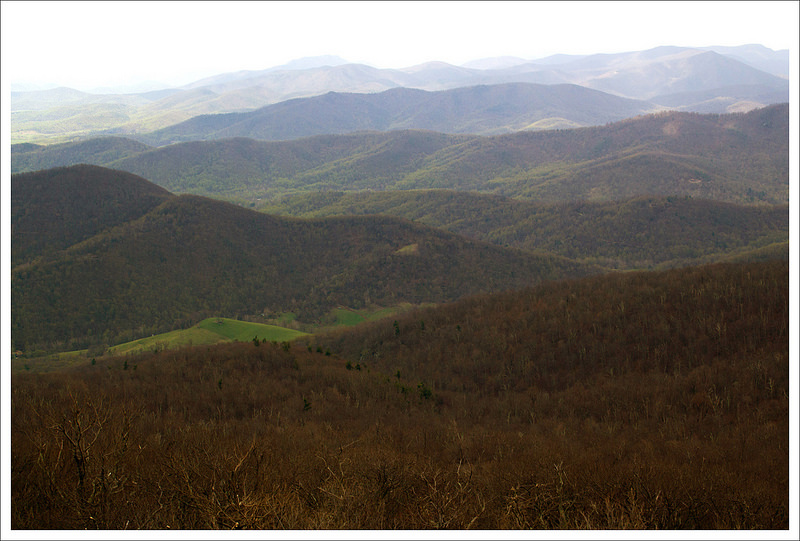 It would be a perfect family hike or a leg-stretcher for folks riding along Skyline Drive. Adam takes in the view from North Marshall. 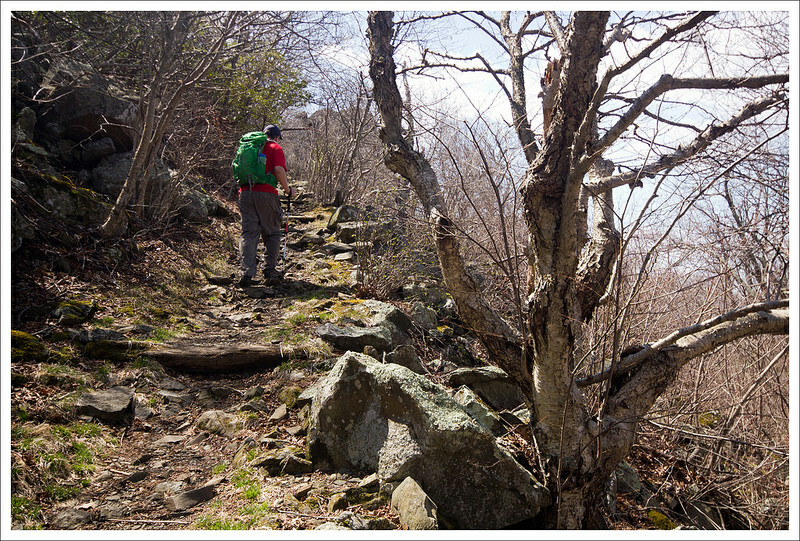 Below: This hike starts from Gravel Springs Gap; Christine on the AT; Adam approaching South Marshall’s summit. This is one of those hikes where you get a lot of payoff for minimal effort. There are some great views from both South Marshall and North Marshall along the way, making this an excellent family hike. Technically, both peaks are part of the larger Mount Marshall, though they feel like two distinct mountains. 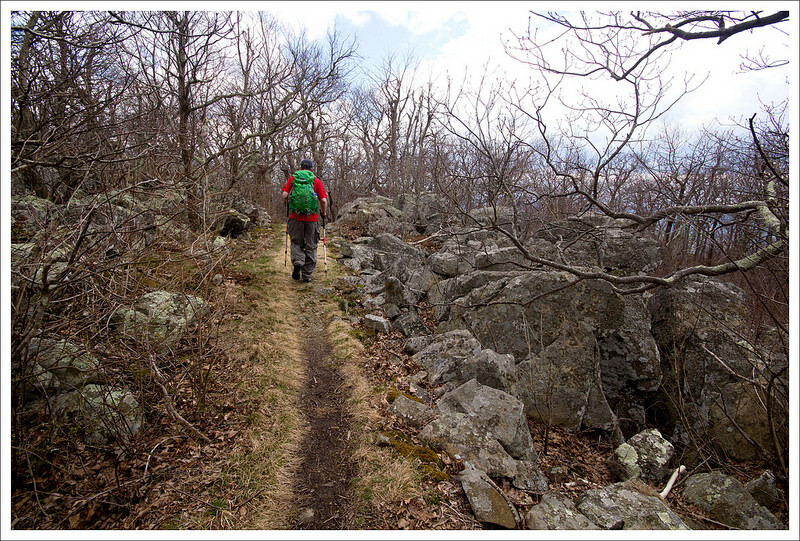 We had covered the Marshalls on a longer section hike along the Appalachian Trail, but we felt this would be a great out-and-back that most people could do. 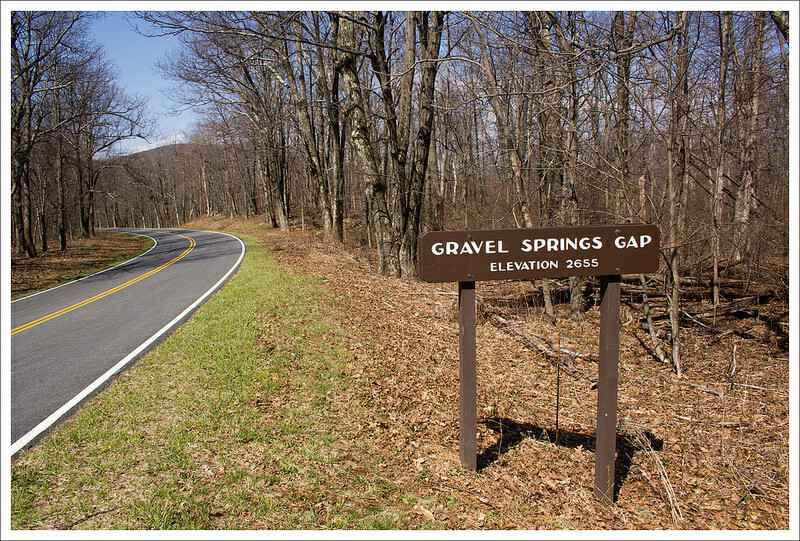 We started our hike from the Gravel Springs Gap parking lot. 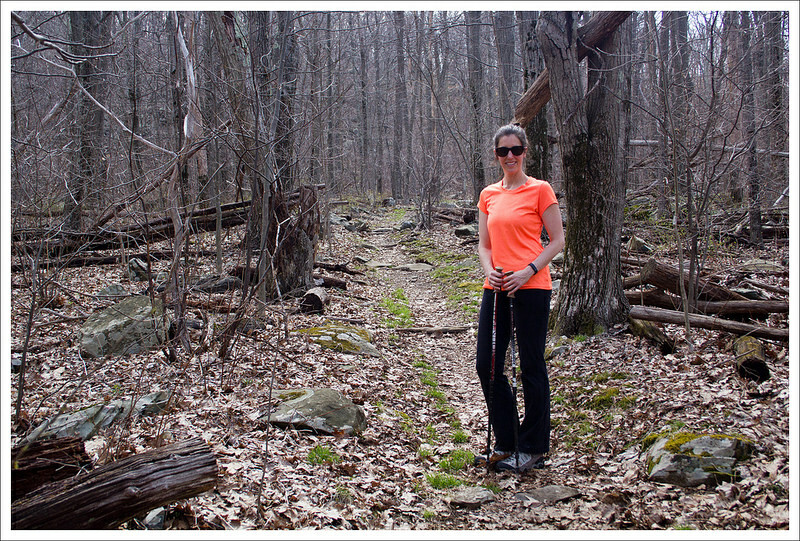 We crossed the road and picked up the white-blazed Appalachian Trail heading north. The trail goes through a wooded area and has a gradual ascent. After .9 miles, you reach your first grand set of views on your climb up South Marshall. Continuing a little further, there are a couple of other viewpoints along the ridge. At 1.1 miles, you reach the highest point of the trail over South Marshall and begin your descent. 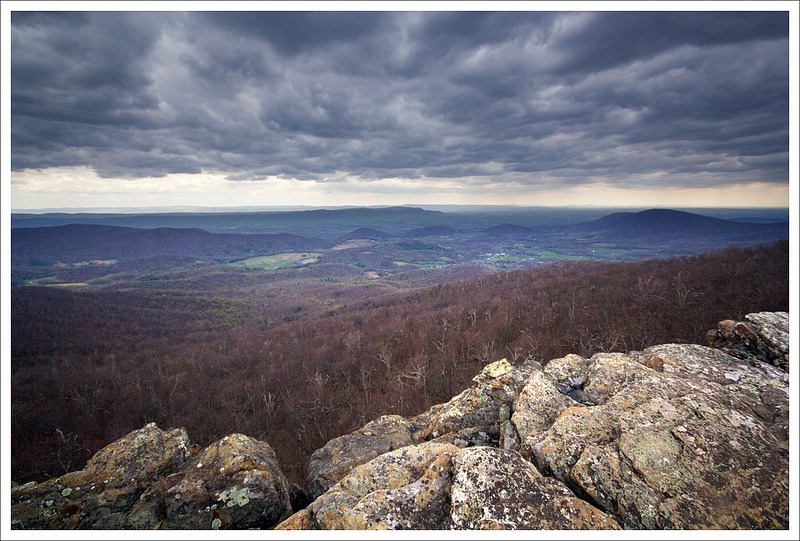 At 1.6 miles, you cross Skyline Drive to continue on the Appalachian Trail and begin your ascent up North Marshall. These views from South Marshall are the first on the trail. Below: Great view from South Marshall; Christine enjoys the rocky summit; There is another viewpoint along South Marshall’s ridge. The trail up North Marshall is a steeper section than what you experienced at South Marshall. Around 1.7 miles, you reach a very steep, rocky section, resembling a stony staircase up the side of a hill. At the top of this staircase, you see a large, monolithic rock. On our climb towards this rock, we heard a loud crow that was cawing at us madly. The toughest part of the climb was now over. I noticed a small, unmarked path around this monolithic rock and decided to explore. 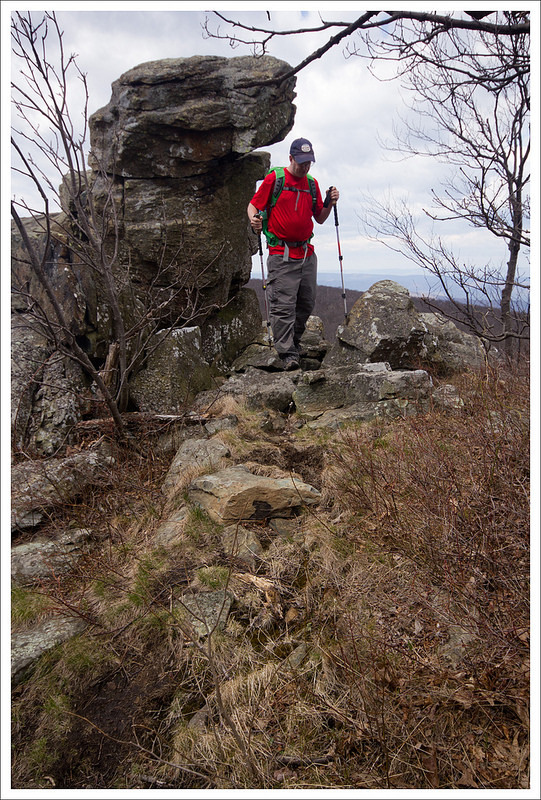 I was pleased to find a few rock outcroppings on this path that led to more spectacular views and you can even see Skyline Drive snake through the mountains. The crow continued to announce his displeasure and I’m guessing there was a nest we were nearing. As I made my way around one of the rock outcroppings, I stuck my hand in a big pile of bird droppings – I’m guessing the crow got his last laugh. After cleaning up, we rejoined the trail. Around 2.2 miles, we reached the last set of views from North Marshall. We continued just a little further to reach the summit, marked only by a small metal survey marking post in the ground, to bag a second peak on the trail. We made our return trip from this point, reaching our car at 4.5 miles. 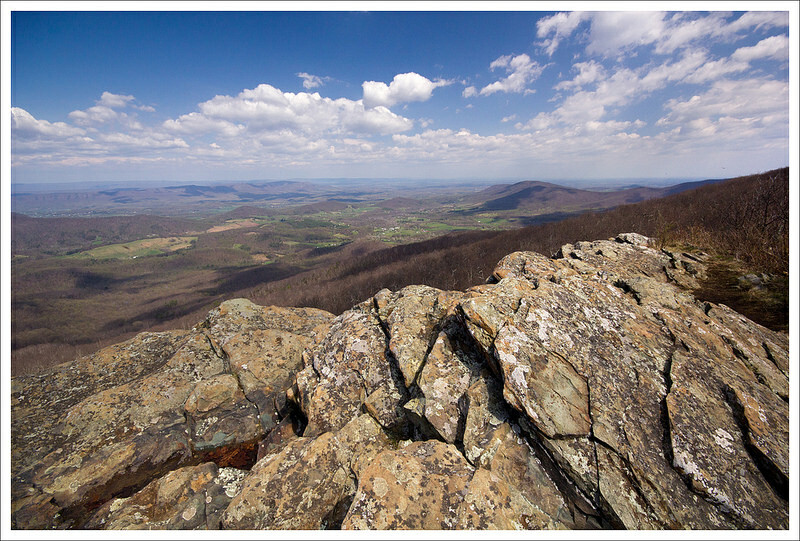 After crossing Skyline Drive, the climb of North Marshall begins. 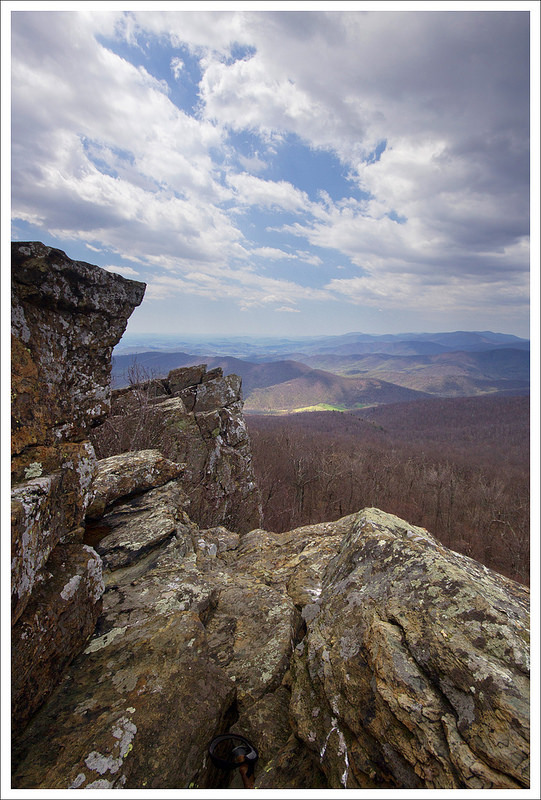 The North and South Marshall Mountains were once known as Bluff Mountain, but were renamed in honor of John Marshall, who served as the fourth Chief Justice of the United States, serving for 35 years (the longest-serving justice in our history). He was appointed by President John Adams and previously served as Secretary of State and leader of the Federalist Party. We’ve been spending a lot more time hiking than writing lately! That’s a great thing (for us), but it’s leaving us quite a backlog of posts to pull together. This hike of The Marshalls is a route I wanted to cover for families and other people looking for shorter/easier hikes. 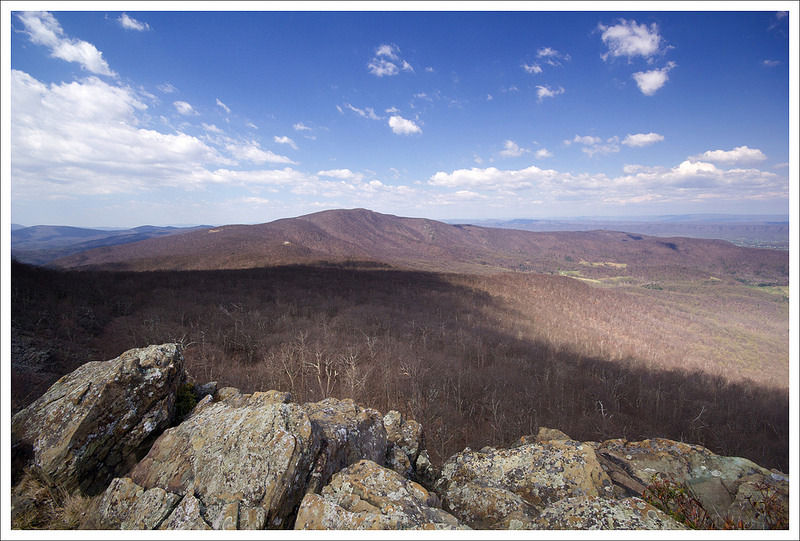 I feel like most of the moderate hikes in Shenandoah are already heavily traveled and well-known. 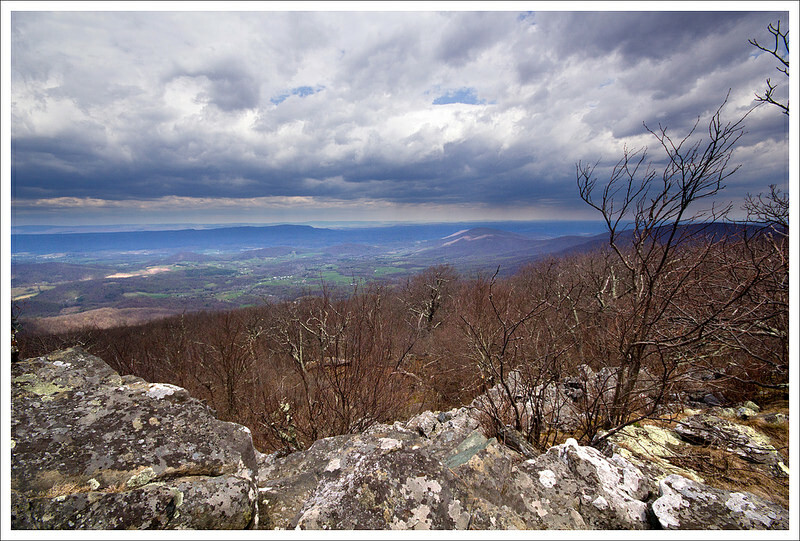 The Marshalls offer spectacular views, but I doubt many casual hikers even know they’re there! We had great weather at the beginning of our hike. It was sunny and breezy – perfect for hiking. It was still early enough in the season that trees in the mountains were bare and only a few wildflowers were starting to bloom. Whenever we came to open vistas, we could see the vivid green color of spring trees starting to creep up the mountainsides from the lower elevations in the valley. It was beautiful! 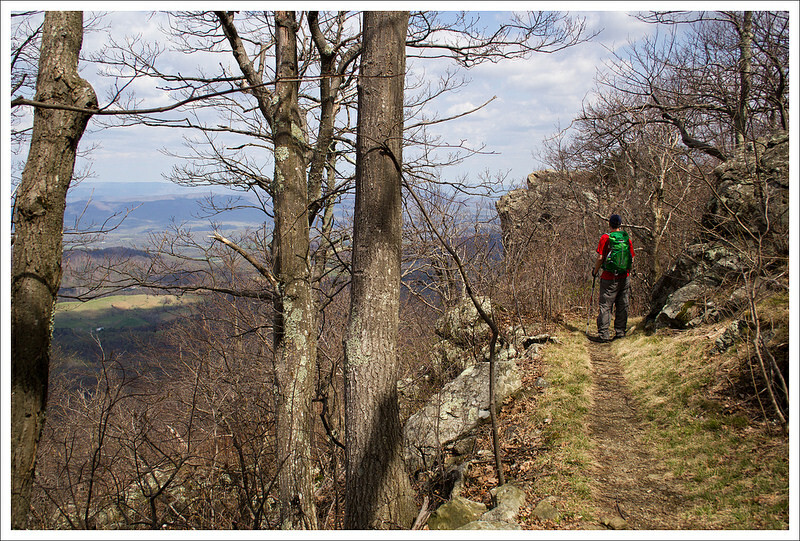 More great views are to be found along an unmarked path that departs the Appalachian Trail. Below: The views from the unmarked path were fantastic; Adam making his way down from his perch. When we hiked this area last time – on a backpacking tip in 2012, we skipped climbing the unmarked trail to the cliff-sides on North Marshall. I’m glad we stopped on this trip, because the rocks were fun to climb and provided some especially nice off-trail views. After the cliff views, we reached the trailside view from North Marshall pretty quickly. I couldn’t remember if there were any additional views along the ridge, so we walked along a couple more tenths of a mile until we found the survey marker. After the survey marker, the trail descends into the deeper woods. The view from North Marshall with the approaching front. Below: Walking the North Marshall ridge; South Marshall’s view was a lot different when we passed by on the return leg of our trip! On our return hike, the weather shifted quickly. What had been a pleasant, sunny day quickly turned cloudy and windy as a front approached. We could see shadowy columns of rain off in the distance and the clouds looked dark and angry. We hiked faster than usual back to the car. We made it back to the car before any rain fell. Difficulty – 2. There is only one steeper section on the North Marshall Mountain, but it a short stretch. Trail Conditions – 4. The trail was in excellent shape. Views – 5. There are so many spots to get views on this hike. Wildlife – 2. You may see deer on this hike and a few soaring birds. Ease to Navigate – 4. Just follow the white-blazed AT. Be careful and keep your bearings if you venture off the trail to get the views near the monolithic rock climbing up North Marshall. Solitude – 3. 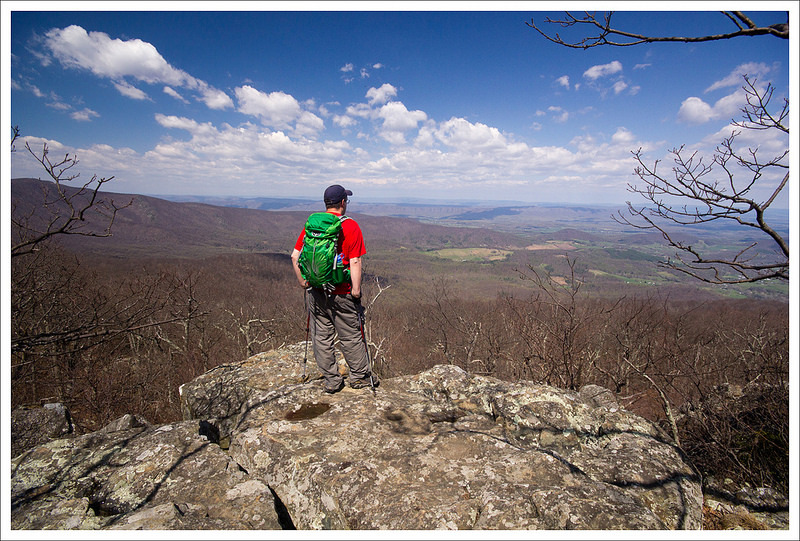 Since this trail is in the northern section, expect to see more people that are visiting from Northern Virginia/DC. 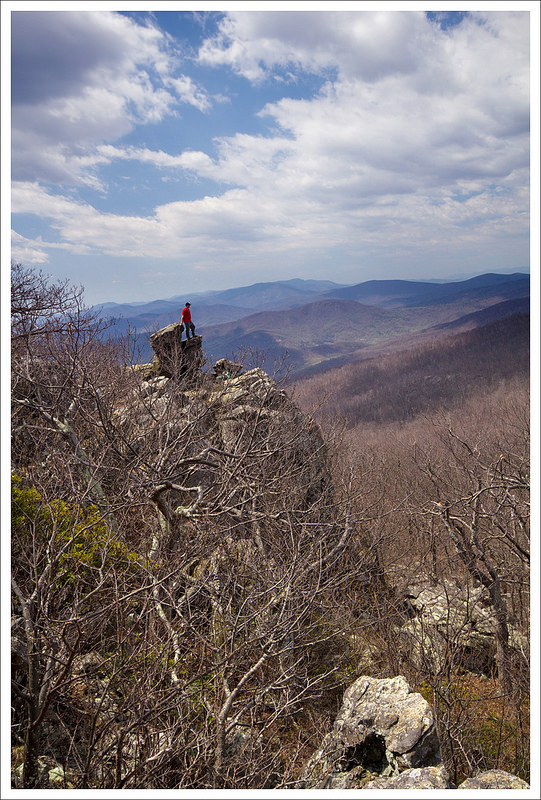 You should expect to see others near some of the view outcroppings. 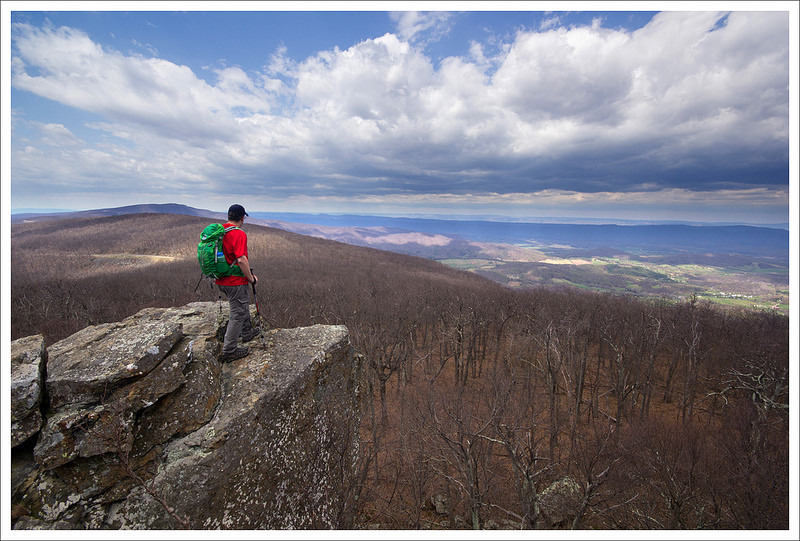 Directions to trailhead: In the northern district of Shenandoah National Park. Park at Mile Marker 17.6 at the Gravel Springs Gap parking lot. Cross Skyline Drive to pick up the Appalachian Trail, heading north-bound. Did this hike today using your write up as our guide. Your directions were spot-on. A nice and chilly post-Christmas hike! Love your website! Glad you enjoyed, Bonnie! Thanks for visiting our site and giving this feedback. Beautiful hike. Thank you for sharing. We loved going off trail at the monolithic rock! Absolutely beautiful. I see you could just do the short 2 mile out back of north Marshall at about mp 16 . There is a small parking lot. Easy 1/2 mile up to the amazing rock you described. I am not familiar with this trail and need to check it out. Thanks for the great photos and descriptions. Thanks for the visit, Art! Beautiful sky in some of these pictures!! Thanks! We did get lucky with interesting photography skies! Awesome, dramatic photos and as always a great write up! Looks like some impressive views. Gotta get this one on the bucket list for sure!! Thanks for the visit, Jim! The nice thing about this hike – so much payoff for very little effort!